The shmup genre, or “shoot em up”, is a genre that hibernates most of the time, waking only partially every once in awhile to let us know we shouldn’t get the shovel and bury it just yet. Treasure is a small development team in Japan, and you might know them by one of their Genesis games, “Gunstar Heroes“. With this game, it seems they were allowed more time, because the quality is very high and it’s lengthier than most shmups. 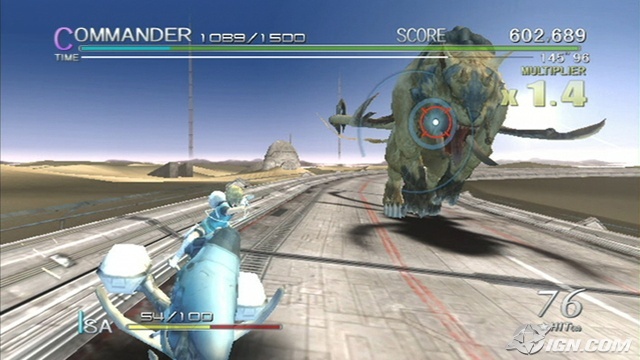 Many gamers of today have probably never played a shmup, and the graphics, while good, don’t compare to games like Gears of War 2; so it’s easy to want to just pass this game up, but trust me, it offers gameplay that is unique and worthwhile. The blue lasers are stationary, the red one aims for you, and robots come from the background. Try to not get hit. I dare you. 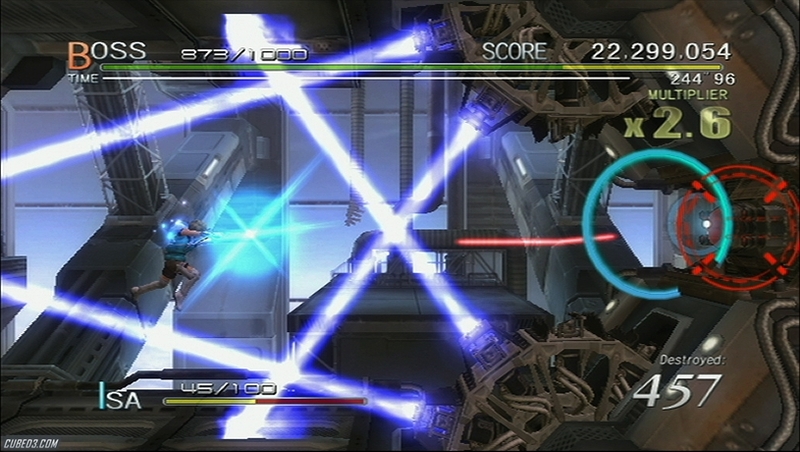 Sin And Punishment: Star Successor is easy to control, but difficult to play, if that makes any sense. In this game you will control your character with the analog stick. Aiming is controlled via aiming the Wii-mote at the television. Your character can dodge in any direction by holding the analog stick in any direction and pressing the Z button, shoot (B button), charge up a larger attack (A button), and melee attack by quickly tapping the A button. Compared to a lot of other games, the controls are really simple, but with how hard this game is at times, it’s great that the player won’t have to remember how to do his/her actions. Aside from just shooting and dodging, you can also reflect objects by melee attacking them, and they’ll fly wherever you’re aiming. If you want to be good at this game, you’ll have to master the ability to pay attention to moving your character and deftly dodging attacks and enemies, while also being able to aim at enemies, since your moving and shooting are independent of each other. Personally, I found this to be very challenging and fun, but don’t be surprised if it takes some getting used to, as most games don’t require this much from your coordination. The giant arms attached to the building and shooting lasers are the real enemy here. The small red ones are just there for points. There are tons of things to shoot, and I just can’t stress that enough. Most of the time there are so many things flying around the screen that it seems impossible to get them all. There are eight levels in total, and each of them has their own theme as well as their own enemies. Each level also has several bosses, all of which are pretty creative, and no two are alike. From fighting a giant mutant leech, to fighting a giant flying bird/lion hybrid, and even various machines and submarines, this game can keep gamers interested enough solely on the curiosity of what’s coming next. There will be lasers on a 2D plane which you have to dodge, missiles and bullets coming from the background, bonus neutral enemies that are there just for points, oh, and don’t forget the enemies in the foreground trying to kill you. This game can get intense, but it’s a good kind of intense. There are only two gripes I have with this game. The first one is that the levels are way too long. You get checkpoints throughout the level that allow you to restart at certain points as many times as you want, and that’s great. What isn’t great is that if you’re trying to get a high score on a level, it’s very difficult, because you must play for a long period of time and hope not to get hit too much (getting hit drops your multiplier down a bit). To most people that won’t matter too much, because they’ll just want to play the game and get through it. However, my second gripe is concerning the confusion that comes when you’re not sure at what point an object from the background has come to the foreground, and is able to damage you. There are only a few parts where it can be confusing as to what can hurt you, and at what point it is able to hurt you, but when it does happen, it can be frustrating. The 2-player mode only allows the second player to shoot (they’re not able to control a character), but didn’t detract from the experience; there’s just too much going on in this game for a “true” 2-player mode. Sin And Punishment: Star Successor is almost a gift from heaven, to me. I recommend this game most to players who like shmups, and those who love challenging gameplay and don’t need a story to have some fun. 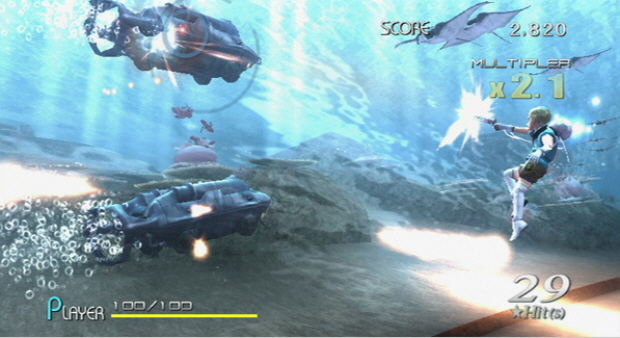 There is an easy, medium, and hard mode, so the options are there for any player to enjoy the game. For those of you who don’t know what shmups are, I’d still recommend giving it a try. 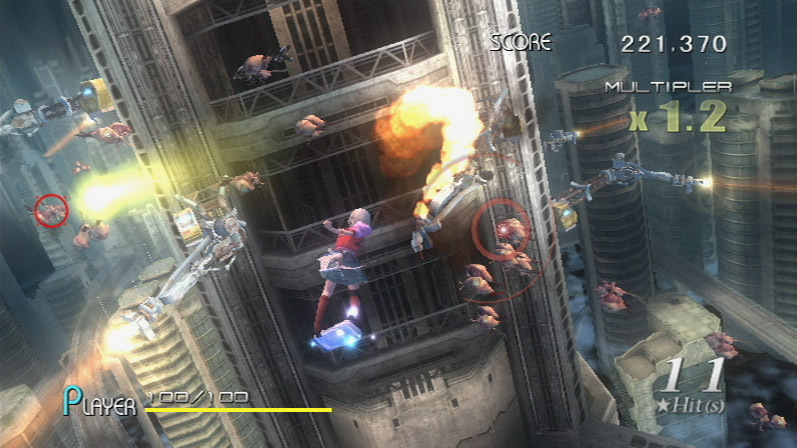 Who knows, you just might be outraged by the lack of awesome shmups and demand more.